You never finish a project like this, but for now, I'm pleased with the outcome (pictured below). There are always things to improve, but the next project underway is to finish building an engine that Arthur had part assembled in the very early '80s. Maybe this will take me another 25-or-so years! 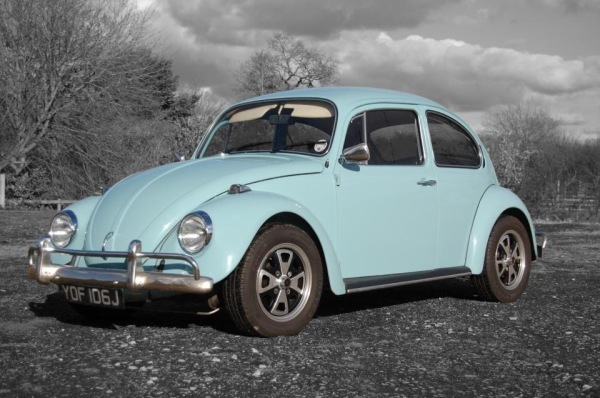 In late September 1987, and after 6 months of frantic Thursdays, when that weeks Autotrader was published, my father-in-law Arthur and myself finally found a Beetle that was worth buying! It was in the dark days of very rusty, very overpriced, and very badly serviced 'Dubs. Since passing my driving test in the previous May, we had looked and 2-3 cars a week on average, which ususally ended with us leaving piles of rust on driveways and uncovered holes along heater channels! Finally we found one with a good interior and a reasonable engine, The bodywork was better than the rest, but it was still pretty poor. In the March of 1988, I decided to take it off the road to carry out a few minor repairs (a hole in the rear wheel arch that let rain into the battery area in particular!). Needless to say, things escalated and my 'Dub then spent the next 25 years being intermittently restored by Arthur and myself.